Jurre Hermans got an honourable mention from the judging panel of the prestigious Wolfson Economic Prize. AN 11-YEAR-OLD boy has come up with a solution for how to prepare for a break-up of the eurozone – and it’s caught the attention of a leading UK think tank. Jurre Hermans was the youngest entrant for the Wolfson Economics Prize, which challenged economists and scholars to prepare a contingency plan for a break-up of the eurozone. The five shortlisted entries were revealed today, but the judges also said that Jurre should receive a €100 gift voucher for his efforts. The Dutch schoolboy focused on Greece in his application – and he didn’t hold back. Worried about the debt crisis, he said Greece should leave the euro – but first all Greek citizens should be forced to swap the currency for old drachmas. Jurre, who has turned 11 since sending in his application last year, has even worked through some of the potential loopholes – anyone found hiding euros or trying to smuggle them abroad would be harshly penalised (financially). 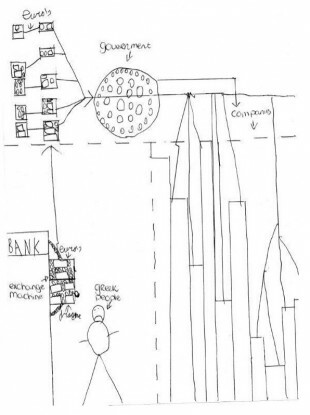 His slightly scary theory came complete with a diagram, special euros-to-drachma exchange machine and a pizza. Brilliant. I made a picture of my solution and I will explain it to you. All Greek people should bring their Euro to the bank. They put it in an exchange machine (see left on my picture). You see, the Greek guy does not look happy!! The Greek man gets back Greek Drachme from the bank, their old currency. The Greek people do not want to exchange their Euro’s for Drachmes because they know that this Drachme will lose its value dramatically. They try to keep or hide their Euro’s. They know that if they wait a while they will get more Drachmes. So if a Greek man tries to keep his Euros(or bring his euros to a bank in an other country like Holland orn Germany) and it is discovered, he gets a penalty just as high or double as the whole amount in euros he tried to hide!!! In this way I ensure that all Greeks bring their euros to a greek bank and so the greek government can pay back all the debts. A bit more about myself: I am 10, love animals since I have a dog and a bird. I live in a family of 5 in Holland. I have 5 friends with whom I play all day, mostly outside. If member states leave the Economic and Monetary Union, what is the best way for the economic process to be managed to provide the sounded foundation for the future growth and prosperity of the current membership? The shortlist includes Roger Bootle and Mark Pragnell, Cathy Dobbs, Jens Nordvig and Nick Firoozye, Neil Record and Jonathan Tepper. Email “See how an 11-year-old would fix the eurozone's Greek problem”. Feedback on “See how an 11-year-old would fix the eurozone's Greek problem”.